Hewlett Packard - 416577-B21 HP/COMPAQ - INTEL XEON 5150 DUAL-CORE 2.66GHZ 4MB L2 CACHE 1333MHZ FSB SOCKET-LGA771 65NM PROCESSOR KIT FOR PROLIANT DL360 G5 SERVER (416577-B21). NEW BULK. IN STOCK. READY TO SHIP SAME DAY. Hewlett Packard - 416659-B21 HP/COMPAQ - INTEL XEON 5150 DUAL-CORE 2.66GHZ 4MB L2 CACHE 1333MHZ FSB SOCKET-LGA771 65NM PROCESSOR FOR PROLIANT BL460C G1 SERVER (416659-B21). NEW BULK. IN STOCK. SHIP SAME DAY. Dell - WX457 DELL - INTEL XEON 5150 DUAL-CORE 2.66GHZ 4MB L2 CACHE 1333MHZ FSB SOCKET-LGA771 65NM PROCESSOR ONLY (WX457). NEW BULK. IN STOCK. READY TO SHIP SAME DAY. Hewlett Packard - 416834-B21 416834-B21 HP Intel Xeon 5150 Dual-Core 2.66GHz 4MB L2 Cache 1333MHz FSB Socket-LGA 771 65NM Processor Kit. New Bulk Pack. Hewlett Packard - 418323-B21 HP/COMPAQ - INTEL XEON 5150 DUAL-CORE 2.66GHZ 4MB L2 CACHE 1333MHZ FSB LGA771 SOCKET 65NM PROCESSOR KIT FOR PROLIANT DL380 G5 SERVERS (418323-B21). NEW BULK. IN STOCK. READY TO SHIP SAME DAY. 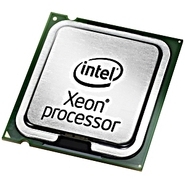 Hewlett Packard - 417784-B21 417784-B21 HP Intel Xeon 5150 Dual Core 2.66ghz 4mb L2 Cache 1333mhz Fsb Lga 771 Socket 65nm Processor. New Bulk Pack. IBM - 42C0566 42C0566 IBM Intel xeon 5150 dual-core 2.66ghz 4mb l2 cache 1333mhz fsb socket-lga771 65nm processor for IBM bladecenter hs21 xm blades. New Bulk Pack. Hewlett Packard - 418226-B21 HP/COMPAQ - INTEL XEON 5150 DUAL-CORE 2.66GHZ 4MB L2 CACHE 1333MHZ FSB LGA771 SOCKET PROCESSOR KIT FOR PROLIANT ML150 G3 SERVERS (418226-B21). NEW BULK. IN STOCK. READY TO SHIP SAME DAY. Hewlett Packard - 416577-B21 416577-B21 HP Intel Xeon 5150 Dual-Core 2.66GHz 4MB L2 Cache 1333MHz FSB Socket-LGA 771 65NM Processor Kit For PROLIANT DL360 G5 Server. New Retail Factory Sealed With Full Manufacturer Warranty. IBM - 42C1555 42C1555 IBM Intel Xeon Dual Core 5150 2.66GHz 4MB L2 Cache 1333MHz FSB Socket Lga 771 65nm 65W Processor Only. New Bulk Pack.